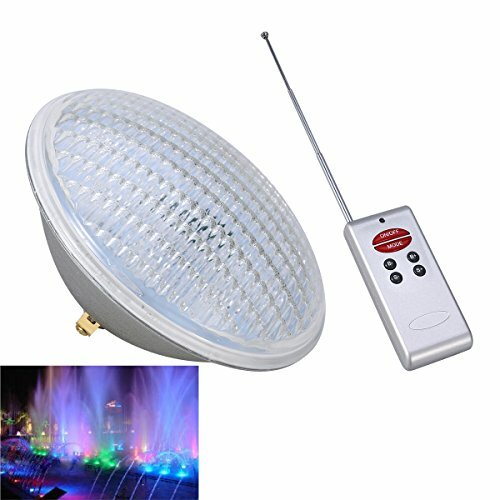 LEDMOMO RGB Swimming Pool Light 45W LED Underwater Light Lamp for Fountain Pond Lighting Decoration with Remote (Silver) | Fountain City Art Ctr. This RGB Swimming Pool Light can be place under water as you like with the flexible design. The dome shape means that the light reaches out expansively to illuminate the pool or room. It will add some colors and lights to your pool, and turn your swimming party or garden into a festive visual experience at night. - Size: Approx. 17.8 * 17.8 * 10.5cm/ 7 * 7 * 4.1 inch (L*W*H). - Dimmable: Controlled by remote controller. - 11 Modes: 7 static modes and 4 dynamic changing modes. - Waterproof: IP68, used in the water, and do not use this lamp for more than 2 hrs when out of the water. - Effective control distance: 20m-80m. - Projects colorful light onto the bottom and sides of the pool, enhancing party atmosphere with the lighting modes. - IP68 waterproof and controlled by remote control. More easy and convenient to use. - Made up of different combinations of red, green and blue light- each with different patterns and displays, some flashing and some still. Projects colorful light onto the bottom and sides of the pool, enhancing party atmosphere with the lighting modes. IP68 waterproof and controlled by remote control. More easy and convenient to use. Made up of different combinations of red, green and blue light- each with different patterns and displays, some flashing and some still. 11 Modes: 7 static modes and 4 dynamic changing modes.And Effective control distance between 20m-80m. If you have any questions about this product by LEDMOMO, contact us by completing and submitting the form below. If you are looking for a specif part number, please include it with your message.